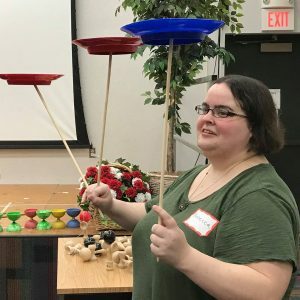 Rebecca Magnan spins plates on a stick. Photo courtesy of Flow Circus. The NJ State Library sponsored a full day training by Flow Circus on Jan. 12 for teen public librarians or staff who work with teens that introduced them to manipulating skill toys – actual fun toys that many of them may remember playing with as children – before the advent of mobile devices with games and apps. 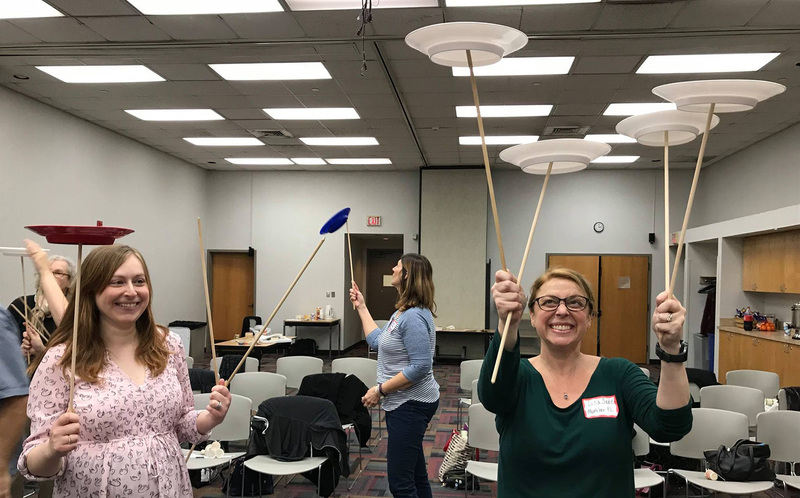 The goal of the training was to teach the librarians to play with these “unplugged” objects so they could encourage tweens/teens to shift their mindset and see “failure” as an opportunity for learning and growth. For half of the day, Flow Circus trainers Dawn Daria and Paul Miller modeled how to spin plates, to yo-yo, work a kendama (a Japanese toy that’s similar to the classic cup-and-ball game), flop balls, flower sticks and a daibolo (two-headed top spun along a string manipulated by sticks). 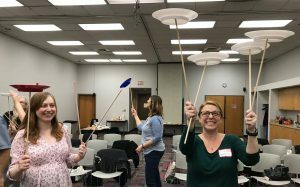 They also modeled how to take a mindful approach to learning about these objects, playing with them, and dropping them (which participants did often). The later part of the day was spent being led through a series of group challenges (that brought out the competitiveness in everyone), making cup and ball toys, and exercises for helping them incorporate skill toy programming into STEAM, summer reading and other tween/tween programming. Attendees also learned a bit about current research on teen brain and social development. Erica Krivopal, Lisa Sedita. Photo courtesy of Flow Circus. Ten kits containing daibolo, kendama, spinning plates with handsticks, yo-yos, flop balls, sets of juggling balls, a tote bag and a digital download of a programming guide were raffled off for attendees to keep. 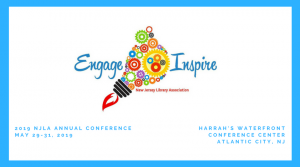 One kit is kept permanently at the NJ State Library for teen public librarians to borrow upon request.